A leading exponent of the rococo school that flourished in Rome during the first half of the eighteenth century, Corrado Giaquinto—a kind of "Italian Boucher"—was trained in Naples. The baroque style that Giaquinto formed there took on a lighter tone after he moved to Rome in 1727, where he specialized in painting altarpieces and large decorative ensembles. In Rome his style also became more classicizing, and the kind of elegant sophistication that marks Giaquinto's mature works soon established his international reputation. Accordingly, he was invited to become court painter to King Ferdinand VI in Madrid, where he remained until returning to Italy in 1762 four years before his death. In Madrid Giaquinto painted decorative cycles glorifying the Spanish monarchy that are a direct precedent for those of his successor, Giovanni Battista Tiepolo (whose 1762 Wealth and Benefits of the Spanish Monarchy is in the Gallery's collection). 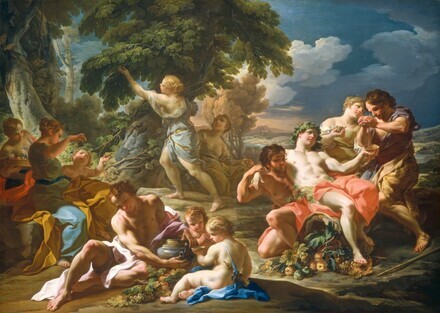 Autumn represents the god Bacchus and other mythological figures lounging in a lush landscape. Dating from the artist's mature period, the 1740s, this work is in almost perfect condition. The painting forms part of a series of four allegories of the seasons: Winter also belongs to the Gallery's Italian baroque collection, while the canvases representing spring and summer are known today only through photographs. Both Gallery paintings, particularly Autumn, with its air of overripe, languid elegance, are superb examples of Giaquinto's art. Fourth Fine Arts Exhibition, Brooks Memorial Art Gallery, Memphis, 1938, no. 15.